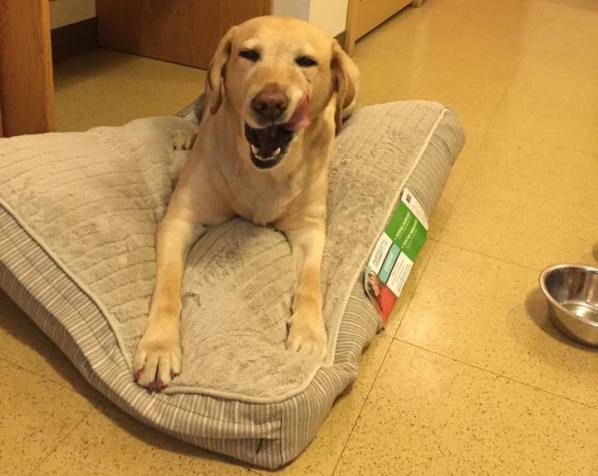 When Yolanda, a guide dog who lives in Philadelphia with a blind woman in her 60s, smelled smoke coming from the basement early yesterday morning, she called 911 on a specially equipped phone. She then woke up her dog mom and led her out of the house, saving her life — for the second time. Last year, Yolanda called 911 when her dog mom fell and lost consciousness. The woman was taken to a local hospital and treated for smoke inhalation. Yolanda is also being treated for smoke inhalation by Penn Vet, according to a tweet this afternoon from the Red Paw Emergency Relief Team, a Philadelphia nonprofit that provides relief for displaced pets & their pet parents. The two may have lost their home, but they still have their lives — and each other. “Yolanda is a superhero!” the Red Paw Emergency Relief Team wrote on its Facebook page yesterday. I couldn’t agree more.